A bright, uplifting fruity floral fragrance with a crisp, clean citrus note softened by a floral bouquet. You’ll feel fresh and feminine. The citrus floral scent includes notes of sweet orange zest, fizzy pineapple, guava, orchid, mandarin blossom, muguet, white ginger, sheer musk and mahogany. 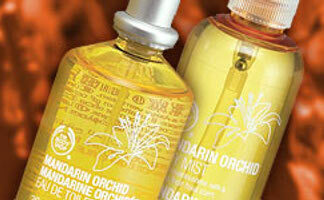 Other recent launches from The Body Shop: Japanese Cherry Blossom, White Musk Blush, White Musk Intrigue. I gave this a spritz last week and found it a little irritating. The orange zest is sweet, very sweet, in fact. This might be good mixed with mulled wine during the holidays, although probably isn't edible. Best left on the shelf, according to my nose. Hope this doesn't sound pretentious. Not at all, and thanks for the review — I have a hard time going into TBS unless I've got a specific reason, so good to know. Yeah somehow they haven't been able to get florals right. I prefer their body range, esp. almond and cocoa butter. Their fruity collections are a hit and miss. But I've to say a long standing TBS classic must be their creamy white musk which I love wearing to bed. Uplifting is just what I need..! This one sounds very nice. I like their body butters, although I don't use them up fast enough and they spoil. I love their body butters, especially the Brazil Nut one. But it is so strong in fragrance, that I cannot mix it with my fragrance. But it is totally indulgent. Their fragrances have not impressed me, though. But I will give this a sniff next week when I go in to buy shampoo and other goodies from their. I had 4 body butters — too many, since as I said I didn't use them quickly enough and they all spoiled. Can't even remember which ones they were. Next time, I'll buy one at a time.